Today was a post Elbert hangover day if you ask me. Some of the others and I felt sluggish and my body just never got energized. All seven of us(LoveNote, Drop-N-Roll, Stryder, Silly Chili, Rockin’, Mtn Rat, and me) that camped together stuck together. I was also super hungry and dreamed of getting to camp and having dinner all day. 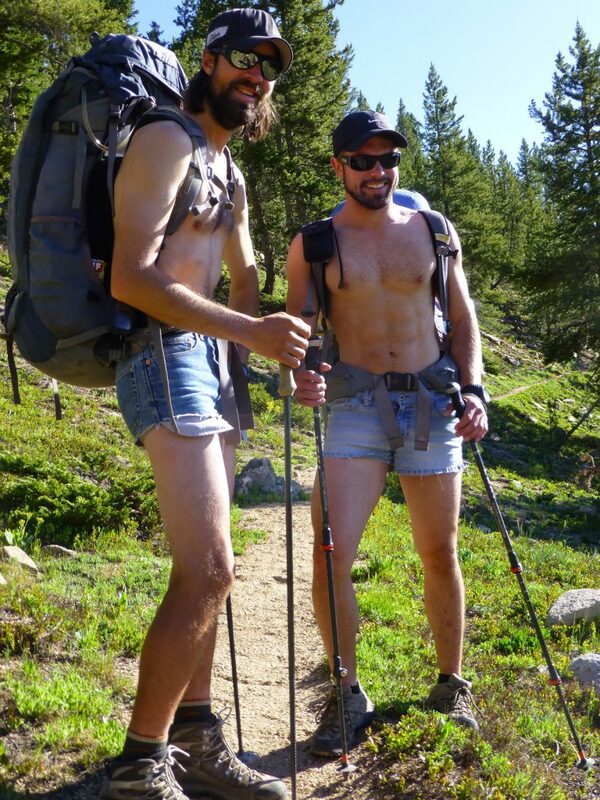 The event of the day is that today was the summer solstice and for thru hikers it is hike naked day. Some of the crew decided awhile back that it would be fun to dress up as never-nudes from the show Arrested Development. There is a character on that show named Tobias who will never be naked and wears short jean shorts even in the shower. 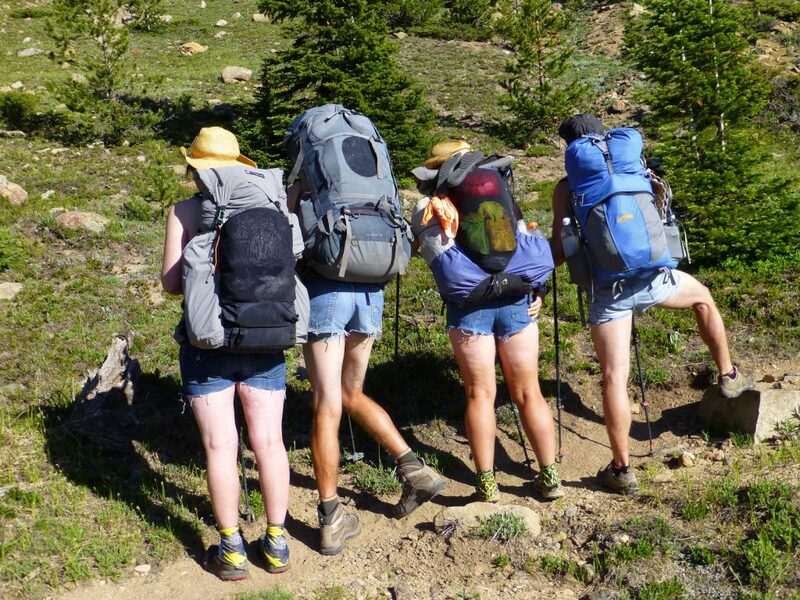 So they got jean shorts at a thrift shop for this special day. It was quite entertaining! Other than that, we had an uneventful day of hiking through the woods most of the day with rolling elevation and one 1,500ft climb that was more steep. It was a fairly rocky forest with many large rocks along the trail and large boulders. It was pretty relaxed with a really long lunch break that included a photo shoot of our lovely never nudes. 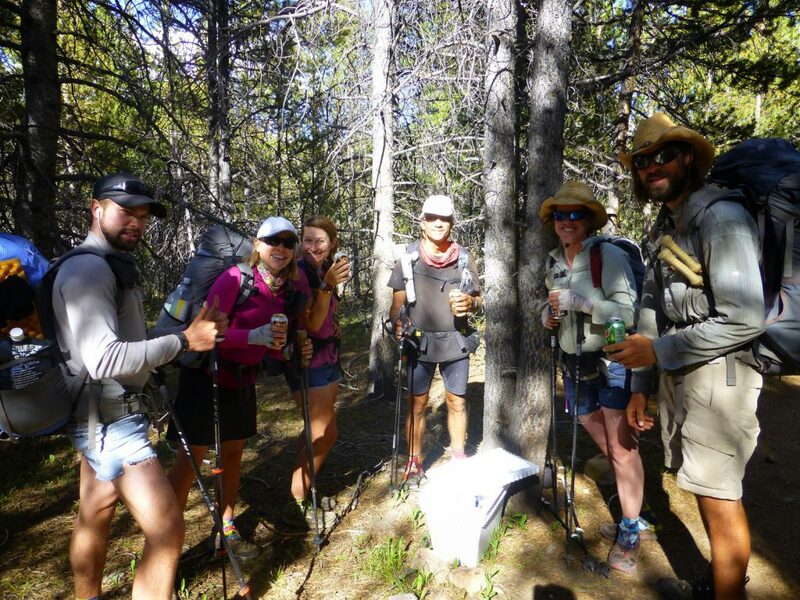 We also couldn’t resist a shot of all of us in our shoes and our dirty girl gaiters. Ah, good times. Unfortunately, we didn’t notice my gaiter wasn’t fully hooked until after the photo. Still great! At the end of the day, there was trail magic left by fellow 2011 PCTer, Slapshot. It was a container full of sodas and the group really enjoyed them. This is the third cooler in a row with just sodas and I don’t drink soda, so I haven’t faired too well on the coolers lately. Still really awesome to have such support. THANK YOU Slapshot! Our end destination today is very close to US 24, which we will cross over tomorrow. We can see and hear the cars just a hundred yards away. We are down low in elevation at just under 10,000ft and we hit a marshy area and had to walk further to find something that fit all of us. We just went with a spot just off the highway. The temps were really warm today, but have been dropping greatly overnight in these low elevation areas. It seems that the cluster of damp cold air just settles in the meadows and that’s kinda where we are. It will be pretty cold in the morning as I is probably in the 30s now. I’m very happy to be in my sleeping bag and I am excited to go to sleep early tonight!